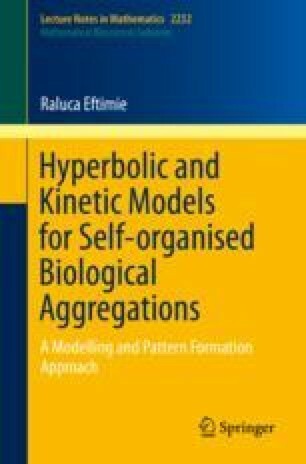 The modelling and investigation of self-organised biological aggregations is a research area that has undergone rapid expansion over the past years. Self-organised aggregations are found in swarms of insects, schools of fish, flocks of birds, mammal herds, bacteria and even human crowds. The complex spatial and spatial-temporal patterns exhibited by these aggregations, from milling schools of fish and zigzagging flocks of birds, to rippling waves in Myxobacteria colonies, have been the starting point of the research in this area. Various types of mathematical models have been derived to reproduce the observed patterns, and to propose hypotheses about the mathematical and biological mechanisms behind these patterns. Some of these models explicitly include various local and nonlocal communication mechanisms. In this Chapter, we present an overview the research area (while briefly mentioning a few individual-based models that are related to the models which will be discussed throughout the rest of the book), emphasise the reason for our approach on focusing only on two specific classes of models (hyperbolic and kinetic), and summarise the patterns that we will discuss throughout the rest of the chapters.